Welcome to my review of the year, which so far has involved 318 posts including this one, resulting in some 117.000 page views and no end of verbal diarrhoea from yours truly! I was looking through the posts for January and everyone was anticipating the withdrawal of the last Yarmouth Olympians, 34109 and 34186. One year on and history is repeating itself with the pending withdrawal from public service of the Yarmouth Olympians, except that over the year 3 more were ressurected - 34108/11/4 with 34186 herself only being saved thanks to the sacrificial donation of a gearbox from her sister 34187, which proved to be the last act of that noble machine. However withdrawal from public service won't necessarily be the end for the Yarmouth Olympians and they will remain in use on Bernard Matthews contract services, and I hope will get the odd running day on special services so us enthusiasts can still sample their far superior ride quality again. So I guess the first pic of the review has to be one of these incredible Olympians who have a desire for life so high they have cheated the scrap yard numerous times now. January also saw me compare the E400's of Konect and First which gave a landslide victory to Konect. At the time the X1 E400's were rattling and shaking themselves to bits and it must be said their future didn't look very bright. To read the review which became one of my most popular posts click here. One year on and thanks to a new maintainence regime they are in much better condition and don't rattle nearly as much. It is just a shame that from this January the X1 will become a mockery of itself as instead of proudly boasting the longest bus route in the country it is now basically two separate routes in 6 sections with destination displays unable to show through destinations thanks to ridiculous EU rules. Speaking of the X1 it was in January that the last ex X1 Gemini returned in First Corporate colours. Anyone remember which one it was? Ok here's a subtle hint! It was also in January that I met Roy from East Norfolk Bus Blog for the first time. Roy has become a good friend and a real source of support when my motivation levels have needed topping up. He is the daddy of bloggers and will remain so for a long time to come. 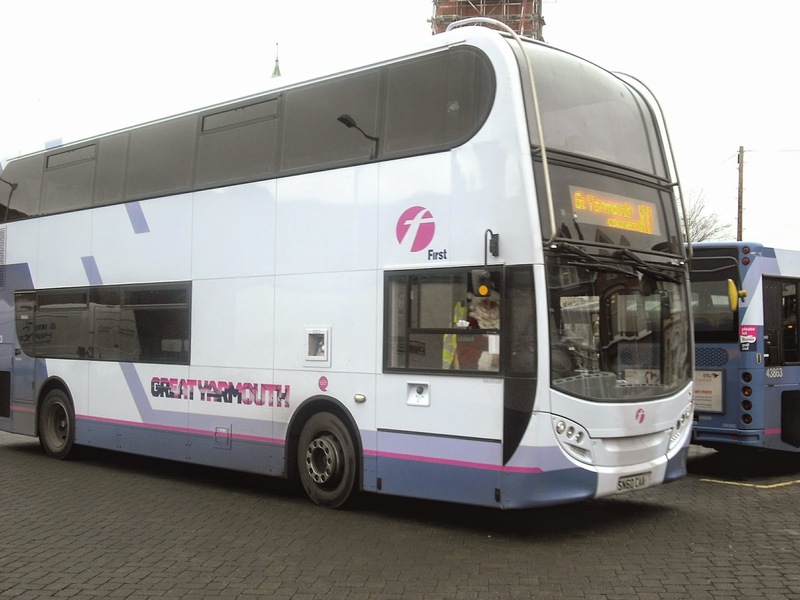 Anglian launched their connected route 7/61/62 from Norwich to Southwold/Halesworth (Beccles) via Yarmouth and Kessingland. Despite being subject to the same daft rules now affecting the X1 this has been a big success and I hope will go from strength to strength with timetable tweaks to allow for unavoidable delays. Towards the end of January I announced that the blog had achieved 10,000 page views in just over 3 months. Currently I'm getting that in around 3 weeks which shows just how far the blog has come in the course of the year. Feburary was a month for repaints. Lots of them. Can you guess which vehicle came back repainted? No? 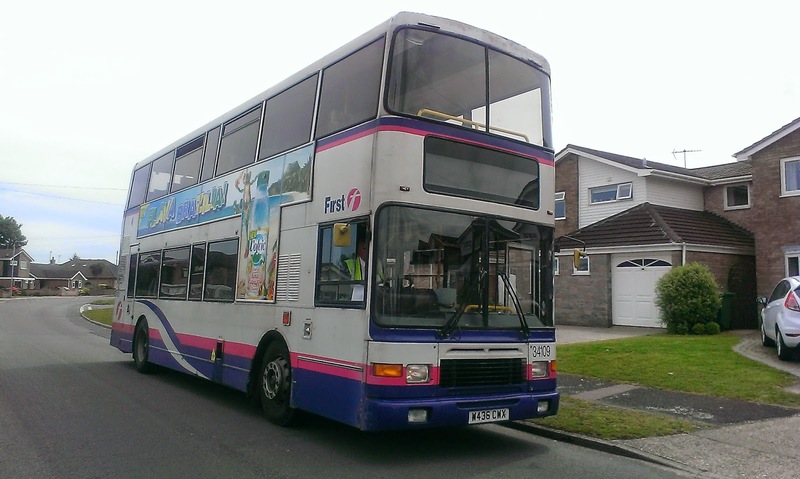 Tough luck as I'm not going to show it because if Chris Speed has dominated the papers this year then this particular bus has dominated the blog pages! So instead I'll show what I consider to be the second best repaint of the month - Ipswich Buses hybrid livery applied to Scania Omnidekka 62. Here is Dave Warren's superb pic originally published on 23rd Feb.
Another highlight of Feburary was the chance to sample a different type of gas bus and compare it to the MAN examples in the Anglian fleet. The Scania E300 demonstrator came to Anglian and it must be said did not meet with universal approval - to read my review click here. 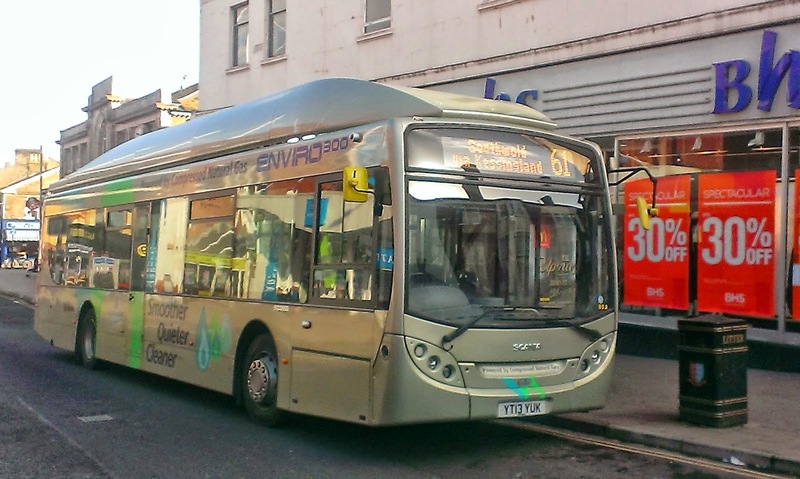 This bus achieved fame a few weeks ago when it became the first bus to run on gas produced from food and human waste - I still say the reg says it all! It was also a mixed month on the railways with some wild weather around. The main line to the South West at Dawlish was washed away, resulting in a quite remarkable restoration in a comendably quick time. 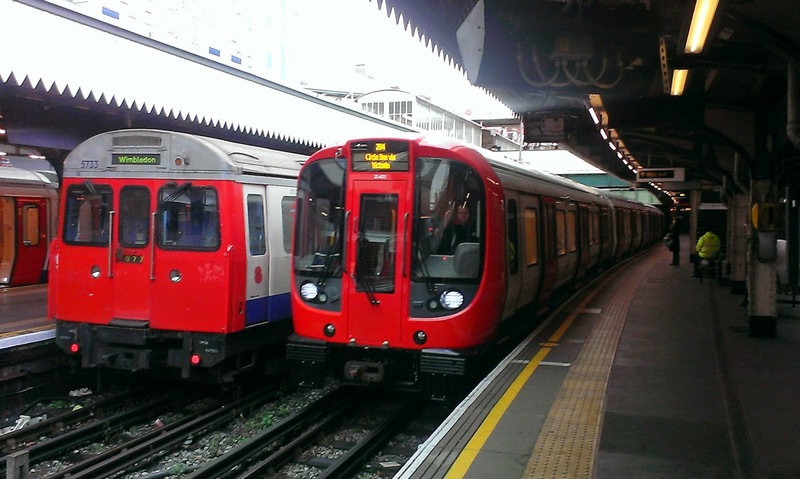 London Underground introduced their new Circle Line trains, smaller versions of the new Metropolitan Line trains which replaced trains that had basically been around all my living memory! Other noteable events in Feburary include the first immigrant from First Leicester to arrive at Yarmouth. Volvo B7tl 32062 was the first of 8 to arrive allowing some of the Presidents to go to Norwich, B12 coaches 20514/5 to move to other duties and B10B Renowns 60807/8 to be converted for driver training. It was a pivotal month for some new "old boys" on the block. BorderBus, who are run by the guys who started and built up Anglian Bus was awarded its first service route in the shape of the 521 between Halesworth and Aldeburgh, to start in March. A brand new mini E200 was purchased and their operation of the service has proved very popular. March wasn't a very eventful month it seems, going through back posts. First announced that the Summer Service 3 would not be Routemaster operated this year, which wasn't the most popular decision of the year. Just about the most exciting thing to happen was the return to Norwich Crown Point of a DMU that was stranded at Lowestoft in the storm surge of December 2013. 153314 was away for 110 days as paddling clearly didn't suit her and I was lucky enough to see her at Norwich on her first day back. Part Two will cover April - June when things get interesting at Ipswich and Summer begins elsewhere. That's Merry Christmas in Portuguese. After yesterday's ordeal of a post I was delighted in the wee small hours to receive a comment on that post, with nothing but a link. Normally any such post gets pretty short shrift before being zapped but something told me this one was different, so taking my laptop's life in my hands I clicked on the link and found myself transported to paradise. Brazil to be precise. Nice to know I have readers there. I have a request for you all. Next time I rave about seeing a Paragon or dare I say even a Neoplan you have my permission to shoot me as they are mere dinky toys in the world of coaches. It is like comparing a lightning storm off the coast of Suffolk to the megastorms they have in the Southern United States. We don't have storms - they do. And now it is my sad duty to report that we don't have coaches either - Brazil does. Let me introduce you to this!!! Stunning is an overused word. It should be reserved for this, not repainted presidents in Norwich! What a beast. Copacabana Beach? Forget it! Santos v Corinthians at the Maracana? A mere sideshow. I want the first plane to Brazil now to sample one of these animals. Here is another pic I found. 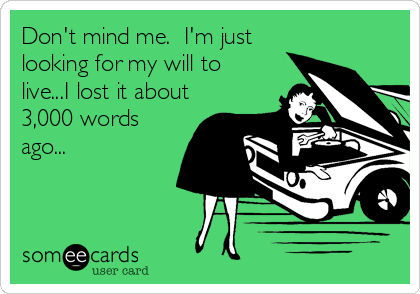 Now unfortunately my Portuguese is rather limited but I have a feeling my hours of chatting to drivers around the region may well pay off as I know two Portuguese drivers on Anglian whose translation skills I am going to call on and I'll do a proper detailed post. But here are a couple more of the amazing coaches on Joao's site, which you can look at yourself by clicking here. 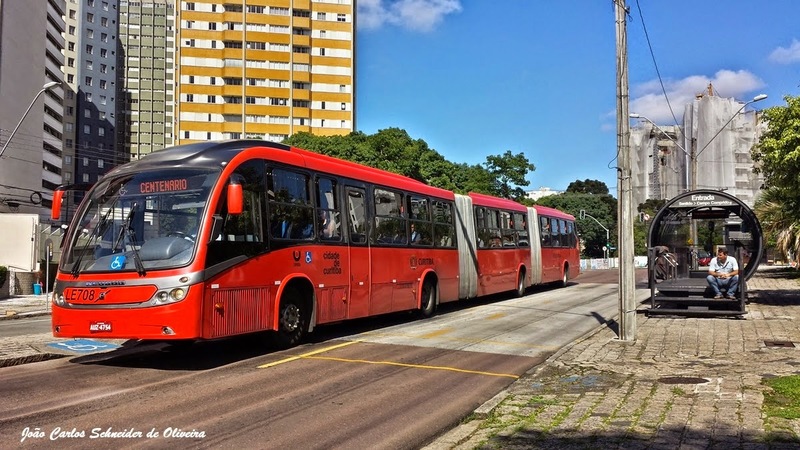 Many thanks for getting in touch, Joao, all the way from Brazil, and I hope you don't mind me showing off your truly magnificent coaches. Darn I'm jealous now. I start saving tomorrow. Just look at those mirrors! How long is that coach? Megabus please take note of these vehicles! And finally we all know what bendibuses look like don't we! Wrong!!! Anyone fancy taking that round Kessingland? Wonder if it rattles! I don't think I could ask for a better post with which to wish each and every one of you a very Happy Christmas and here's to an eventful and probably very colourful 2015. First Fares Explained - Sort Of! Those of you who are as old as me (over 24) might remember an American sitcom of the 70's called Soap. At the start of every programme they would run down the current synopsis involving a multitude of characters, finishing with the words "Confused? You won't be after watching this week's episode of 'Soap'!" 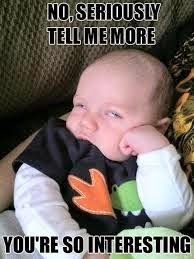 After trying to explain the new First fares which apply from January I may need to use the same phrase, except I can't promise anyone will be none the wiser after I've attempted to make head or tail of today's announcement. NI had already planned to make a post explaining why fares will still go up despite the recent crash in fuel prices. Quite simply the vast majority of firms buy their fuel a year in advance, known as "hedging", which means at the moment they will be paying a higher price for the fuel than it is at the pumps. Next year may well see firms benefit if prices remain low for a considerable amount of time, but don't expect that to be passed onto the passenger. There has been much spluttering and political style answers from various people in the industry I've spoken to regarding passing on fuel savings to the customer! 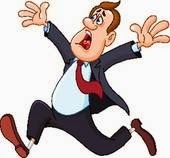 The ususal reaction when cheaper fares are mentioned! So obviously being aware of this today First announced that many fares were being frozen, some were going down and those rising only going up the rate of inflation - "While some passengers may experience an increase in fares, we have tried to limit this as much as possible and keep any rises in line with inflation. "- which right now stands at 1% due to oh yes cheaper fuel prices! OK so let's analyse that. Let's start in Norwich. If you pay a single fare and currently pay £1.10, £2.10 or £3.00 then your fare is frozen. However if you pay £1.30 you might expect it to go up by a penny or so which is the inflation rate. Not so as it's going up 10p which is a rise of 7.69%. If you normally pay £2.50 that's going up to £2.60 which is still a 4% rise. Where Norwich benefit are the multi trip tickets, with one glaring exception. 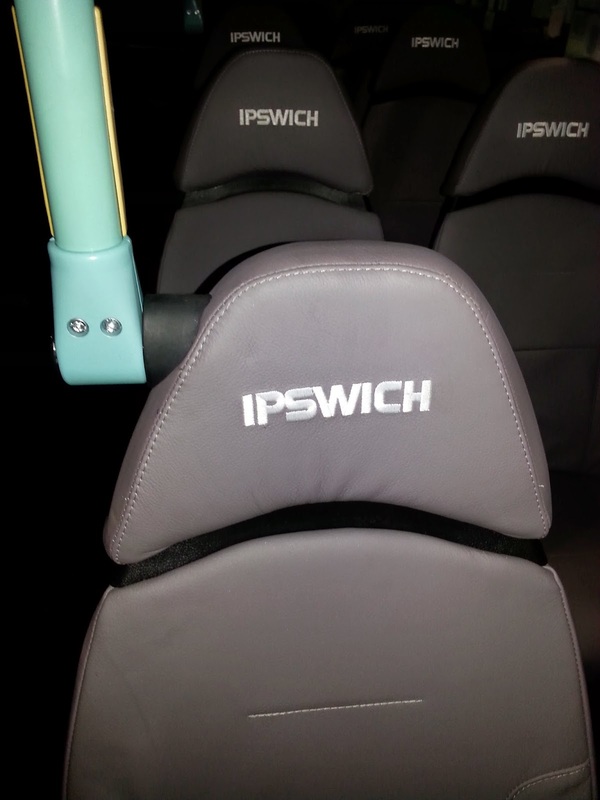 A Norwich 2-trip ticket rises 10p to £4.30 (2.38%), however an Inner 2-Trip and Norwich Day ticket remain unchanged. 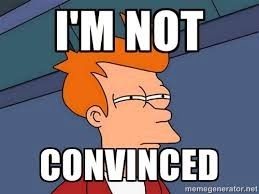 But a Norwich Weekly drops from £19 to £18, a Norwich 10-Trip drops from £18.50 to £17, and a Norwich Monthly drops from £66 to £63. Now anyone getting on a First bus recently will have noticed a big green hand staring you in the face advertising the Hi-5 ticket - they are really pushing this ticket so of course in the Norwich area this has gone up from £7.50 to £8. A rise of 6.66%. If you think Norwich was confusing you aint seen nothing yet! Starting with single fares the number of single fares in the Yarmouth area is doubling from 2 to 4. So if you currently pay £1.30 you will either pay £1.10 or £1.40, and if you currently pay £2.50 you'll either pay £2.10 (very good) or £2.60. Single and return fares outside the Yarmouth area will remain unchanged. On the Multi-ticket side a Yarmouth Day ticket goes up 10p to £4.30 (2.38%), the Weekly remians at 315 but the much publicised Hi-5 goes up a quid to £7.50 - a rise of 14.4%. Now it gets compicated. Currently there is a YarLow ticket and a YarLowXtra ticket which encompasses a wider area. So now only the YarLowXtra will remian, which means if you currently use a YarLow ticket you are in for a pleasant surprise. Although if you use a YarLow Day ticket you'll have to pay an extra 50p to £6.50 (8.3% rise) it is the same cost of a YarLowXtra ticket now. However if you currently buy a weekly YarLow at £20 that remains the same but you get the extra area, meaning a weekly Xtra ticket goes down a pound to £20. Even better is the 10-trip ticket which reduces to £19 from £20 YarLow and £21 Xtra. The bad news is the current YarLow Hi-5 goes up a whopping 25% to £10 but does include the wider area. Still with me? Well done! 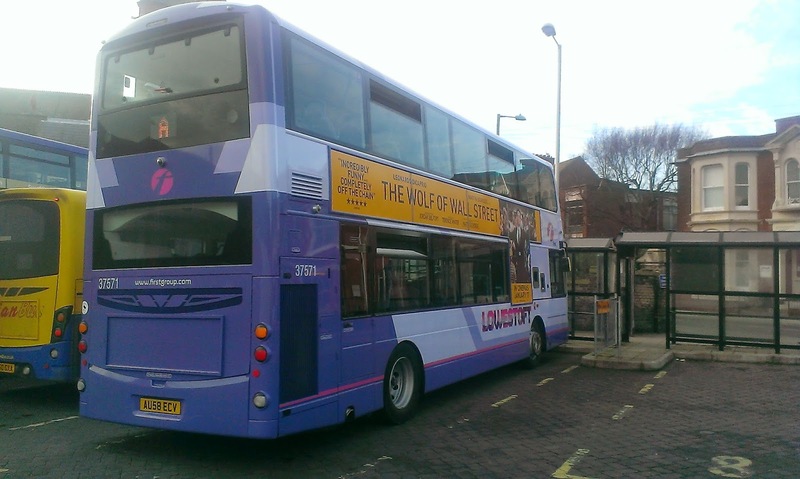 Lowestoft is a mixed bag with single fares rising but returns falling. If you pay £1.20 single you'll now pay £1.30 (8.6% rise but still cheaper than Anglian's £1.40). The £2.00 single remains the same and the £2.40 single rises to £2.50 (4.3%). However the £2.00 return remains the same, the £3.30 return falls to £3.00 and the £3.80 return falls to £3.50. The Lowestoft 2-Trip ticket is withdrawn and the Lowestoft Day ticket falls from £4.80 to £4.50. However the Weekly rises from £14.50 to £15.00 (3.45%) and the Hi-5 rises from £6.50 to £7.00 (7.2%). If you live in Beccles it's not very good news. 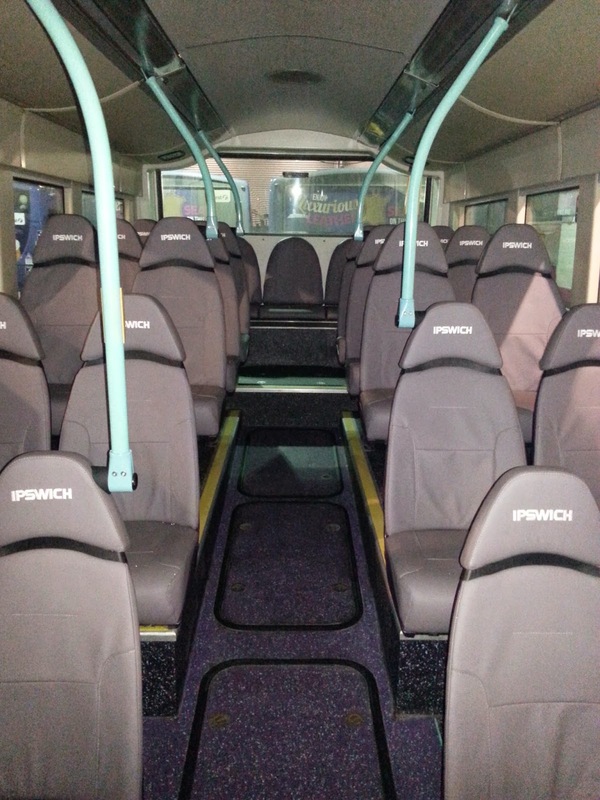 The Beccles - Lowestoft £3.00 return is rising to £3.50 (16.6%) and the Monthly X2 ticket currently £60 is being replaced by the YarLowXtra or Norwich Weekly at either £70 or £63 respectfully. Basically if you live in Ipswich you are likely to benefit, if you don't you'll pay more. I think I'll just paste from the First website as it explains it all perfectly adquately. Suffice it to say there's not a single fare that rises by only 1%. My apologies for the slightly wayward layout below but it looks perfect on the draft page and even this took me far longer than it would have done to just describe the fares as I have in the above sections! Seemed like a good idea at the time but pdf to Blogger doesn't paste well! A new ticket for those travelling between Dereham and Peterborough is to be introduced, if they can understand the destination screens that is, and all Whole Network tickets are going up. In conclusion it could have been a whole lot worse, but there again not even First are mad enough to put fares up wholesale when fuel prices are crashing. They need to persuade people not to go back to their cars with the cheaper running costs. Will this fares package do the trick? I Doubt it as the longer distance traveller doesn't gain much at all, and they were the ones that needed the most sweet talking. Just one thing - don't make false claims. Not a single fares rise has been kept to the rate of inflation,and to claim so is a little bit naughty. I forgot my camera today - one of many things I forgot to do today so no pics but a quick post with some Ipswich news. I was surprised to see Volvo B12 Paragon 20515 on the forecourt of Ipswich depot ths afternoon as I had been told 20514 was there to cover Bury St Edmuinds Rail Replacement duties. However it transpired that 20514 was due a safety exam and its sister was covering for a coupleof days and is returning to Norwich tomorrow. 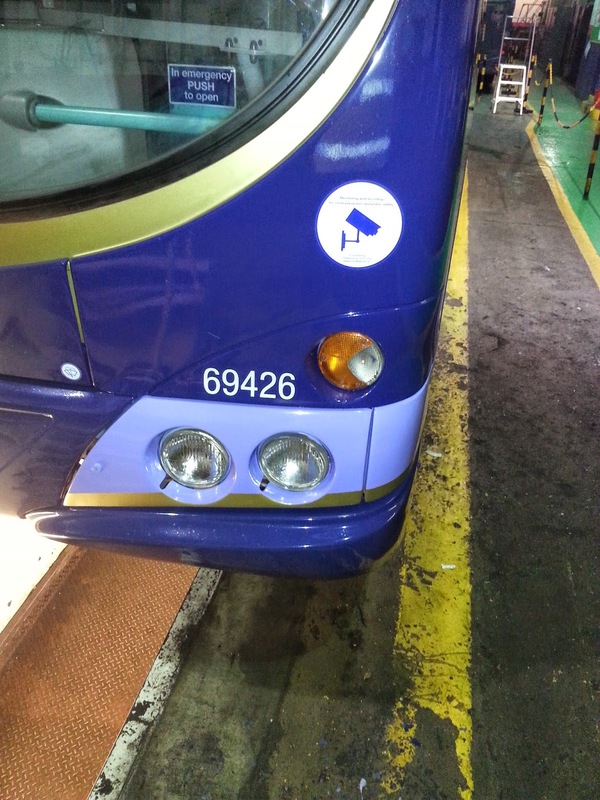 The 5 Volvo B7tl's to be fully 66 branded have been decided. They will be 32493/4/653/5/6. The partial branding on 32488 is likely to be removed. This will be done in the new year. Those of you following (rather surprisingly) the whereabouts of Scania 65670 will be delighted to know that it has passed its MOT and will be ready for service again shortly. 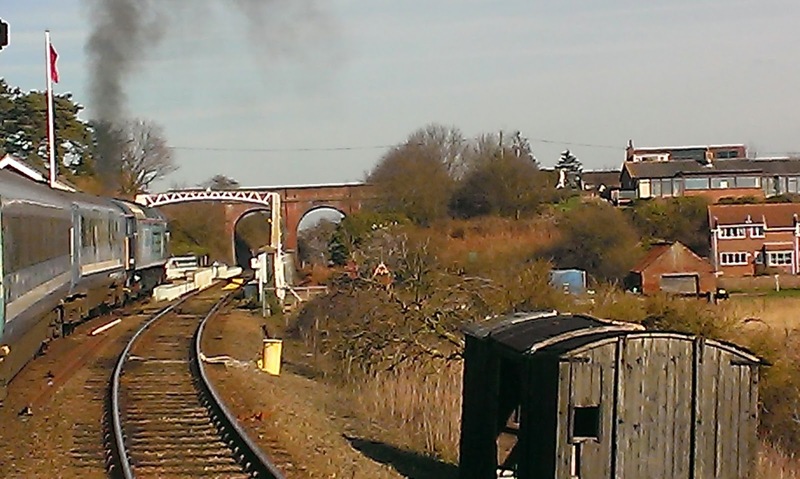 However early in the New Year it will be transferred back to Essex, along with B7rle 69433. Remainng Ipswich Scanias 65579/88/9 will be withdrawn. One of the Routemasters (the Yarmouth one) unfortunately broke down on Saturday while on wedding duties and remains at Ipswich. Now there was a bit of talk in the RM department this afternoon but until I have it confirmed I don't want to get tongues wagging too much but watch this space in the New Year. Now I don't often mention individual drivers but there is one in Ipswich who should get an award for either sterling service or complete and nutter insanity. Chris (yes another one) has been driving Ipswich Buses 38 Free shuttle in an anti-clockwise direction around Ipswich every 20 minutes for 7 years now. You can get less for murder! I would have needed the men in white coats to rescue me after a week of doing that so to do 7 years is nothing short of mind boggling! Good on you, Chris, as I know everyone who uses that shuttle thinks the world of you. PS I was informed earlier that turquoise painted ghost bus 32100 has made its debut on the ORANGE Line in Norwich today. I think it fortunate that the good people of Norwich have a healthy sense of humour! 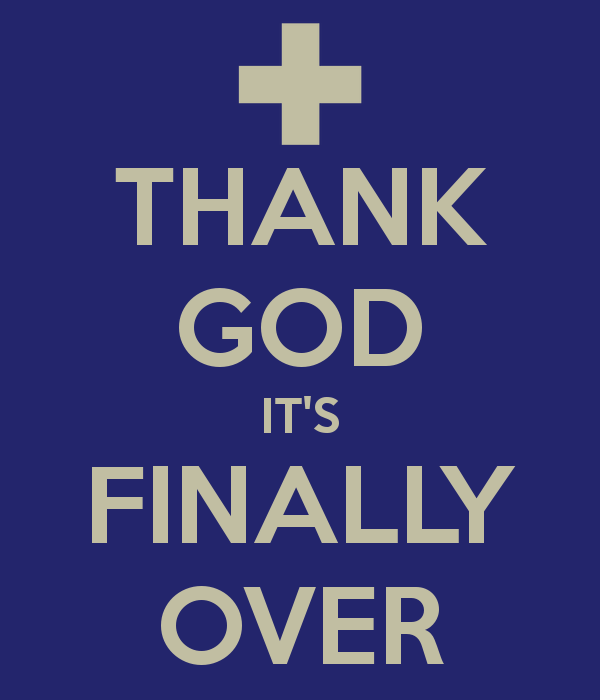 The last round up before Christmas and to be honest I haven't saved much as everything this week has demanded instant posting, so it's going to be more of a light hearted one this week, plus a couple of items that demand a repeat. This week has seen a lot of companies getting into the Christmas spirit, with one still thinking it's Summer! Santa has been driving buses all over the country, most notably in Lowestoft on Thursday, choosing 33423 as his sleigh. 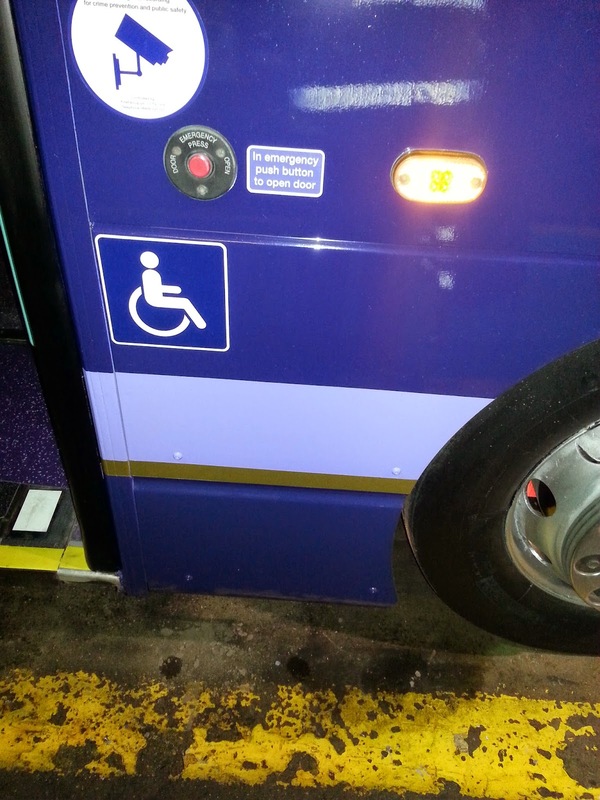 Other buses were being adorned with all kinds of festive decoration. This is BorderBus's E200 BB62 BUS as seen at Beccles yesterday. However over at Ipswich Buses it is still glorious June and those lugging Christmas shopping back to Whitton today may have been more than a little surprised to see a certain Leyland Atlantean waiting for them! IB themselves were so impressed they posted this pic on Twitter and made my day! I have a feeling this won't be the last pic of IB9 before Christmas! I make no apologies for posting this pic for the second time in 36 hours. If 33423 is to be repainted soon into full Excel livery then I have a feeling there maybe a couple of worthy replacements for most photogenic buses at Ipswich in the form of 69426 and when it returns 69428. There has been anticipation of the alternative livery for a few weeks now and boy has it been worth the wait. I assume when their dedicated route starts in April there will be much application of route vinyls but until then, and as long as they are kept clean - including the wheels, these look superb. Here is one of David Warren's pics that are so good they could be published anywhere. 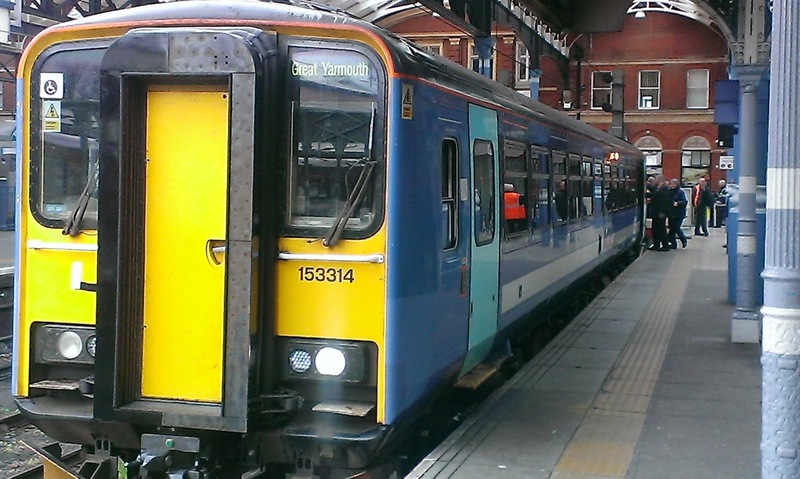 Now there is debate if that blue is Excel blue - the livery is certainly based on the Excel livery, which apparently was Lord Speed's request, but I think it is a couple of shades darker - finally Ipswich Town blue in Ipswich?. Here is Excel Gemini 37578 for you to compare. The same blue or not? Now you know by now that I never miss an opportunity to post pics of the Yarmouth Olympians and Friday saw me down by Beach Coach Park to see what was on the Bernies convoy. But first let's see what was in the coach park itself. Erm, Oooookay!! Moving swiftly on! So at 1415 you could have seen myself and Cameron, who had joined me, squinting into the distance to see what was on the way, and we were were treated to 3 Ollies leading an ALX400. Thank you Bus Gods! Now this has happened a few weeks late for Halloween but I was looking at the pic I posted on Friday of Norwich President 33100 in her new Turquoise livery and I noticed a couple of things that I, and indeed no one else had spotted on first posting. If you look closely you will see two mysterious faces, one in the bottom centre of the windscreen, and the other on the lower deck just above the Norwich logo. I have asked da Boss whose only concern was had they paid their fare. In my driving days I had several what I would describe as supernatural experiences, but this is quite bizarrre, so if anyone from either First or Simon Morris in Ipswich, where the pic was taken, can explain what is in the pic I'll be delighted to publish it as I am totally unable to find a logical reason for it! Back in September I announced the STEVE Awards, which would recognise various aspects of excellence within the public transport industry. I am delighted to report that the first STEVE award was presented to a member of staff at Anglianbus this week, and I am hopefull that four more will be presented before the end of the year. There will then be a special post. The final three awards will be presented in the New Year as the recipients concerned aren't as local so more complicated presentation logistics apply. So all that remains is for me to wish each and every one of you a very Merry Christmas, or whichever Holiday you are observing, and next week's Round Up will be a review of the year, which may well take more than one part! There haven't been many days like this for a long time, with both Ipswich and Norwich getting repaints back on the same day, and both firsts in their own right. Earlier today I posted pics of 69426 that Paulo had sent First Class post (pun intended) from inside the depot. Later today David Warren got some daylight shots of her and being the decent chap he is has sent them to me to use on here tonight. I think you'll agree they're not bad! There were also two other repaints at Ipswich today - both Yarmouth Routemasters were down for something I don't know what but David again was there to get a great pic. There was also a new arrival in Norwich today. The first vehicle to be painted in Turquoise, Trident 33100 arrived back, and Chris Speed posted this pic on Twitter earlier today. 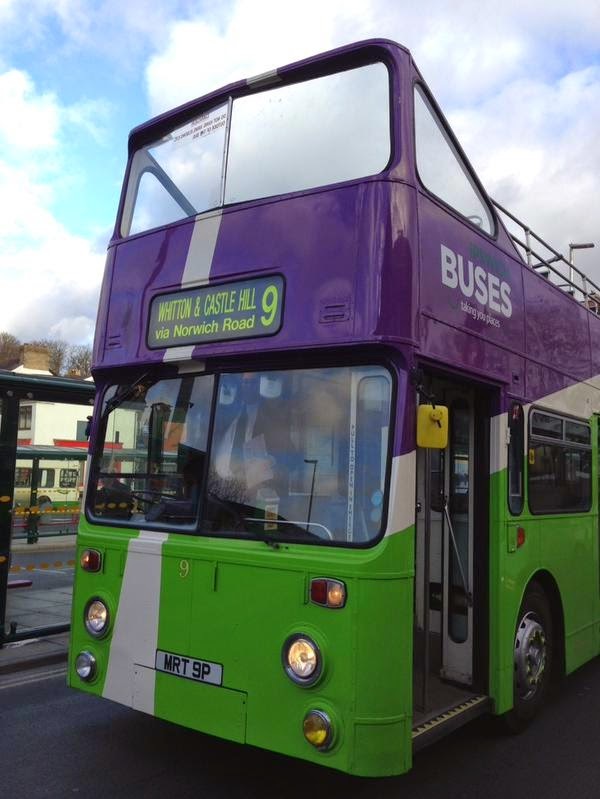 Note the Norwich branding on the front, which will be applied to all the branded repaints eventually. I wasn't sure how this colour would look but actually it's not bad. 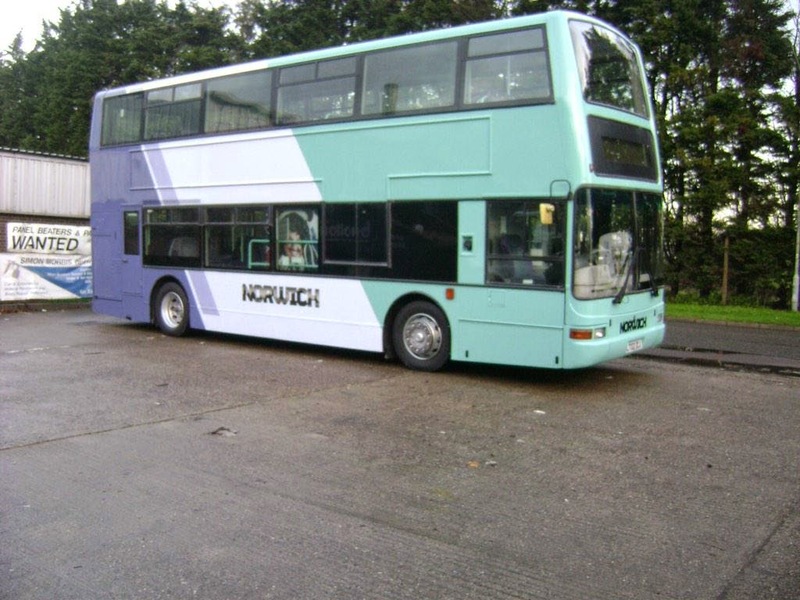 First Norwich 33100 in her new turquoise livery. With huge thanks to Paulo at Ipswich I can bring you pics of the newly returned B7rle 69426 in her Excel style livery. Still can't give details of exactly what she'll be doing but for time being will be in normal traffic until her dedicated route starts in April. I have a feeling this will be a much photographed bus over the coming days! Many thanks again, Paulo! This only took place because yet again my bus didn't have heating on it so I decided to warm up by getting off and seeing if there was anything interesting going on in Lowestoft. Not a huge amount if I'm honest but a few decent photo ops came my way with an appearance by someone even more ubiquitous than Chris Speed! 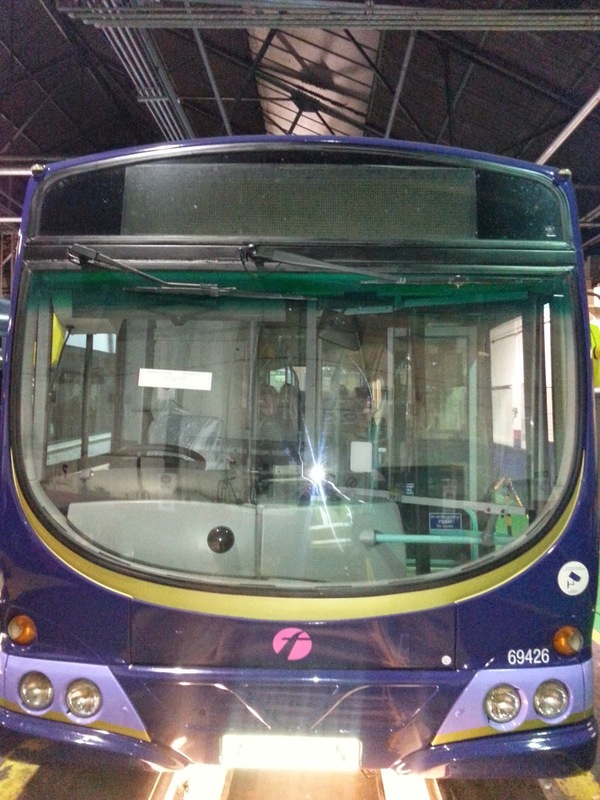 Firstly two of the three ex Jersey Darts recently transferred from Yarmouth have had their Yarmouth branding removed. They all might have done for all I know but only saw two. Shortly after 43863 left it was replaced by an out of service 33423, which I assume got caught up in the Acle Straight probs earlier. It did mean that at one point there was quite a mix of deckers on show with Anglian's ex Konect Trident 722 adding some variety. One thing that always seems to happen in the run up to Christmas is bunching. The accident on the Acle Straight this morning certainly didn't help but it is very rare to see too Anglian 61's together. This happened today in Lowestoft with two Yarmouth bound services leaving together. And then the appearance by a very special driver. If Santa thinks 33423 is worthy as a sleigh, then really they should leave her as she is! Who needs Rudolph when you have Alex and Dennis! 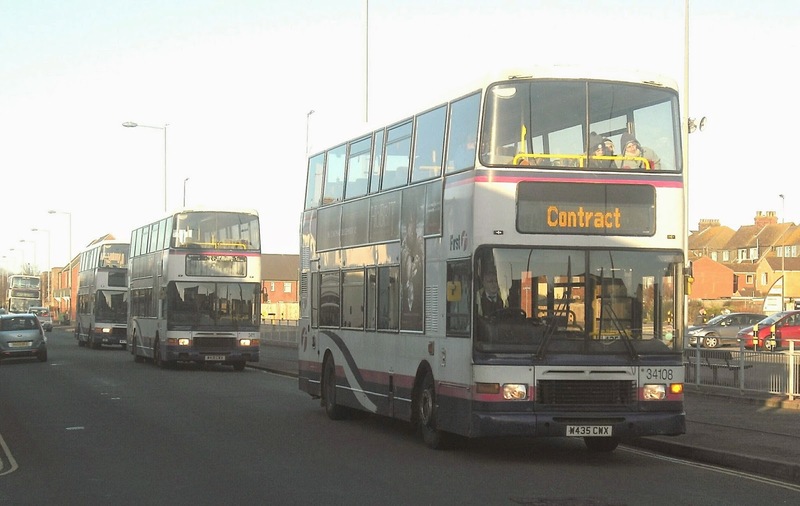 Finally tonight a few days ago in my report from Ipswich I said the 4 Volvo B10B Wright Renowns on loan from Rotherham were returning there by the end of the year before being sent on their next task - one of them being 60622 who was at Yarmouth until a couple of weeks ago. Well it seems that she must have enjoyed herself there as she is coming back and bringing her three sisters with her. They will be based at Yarmouth as cover while the ALX400's are being converted to DDA compliant. As yet I'm not sure if a couple will go to Lowestoft to cover their ALX400's when they go. Also January 25th will be a sad day as the Yarmouth Olympians will finally be taken out of normal traffic and used only on contracts unless it is them or nothing. My thanks to Chris Speed for the info and permission to publish. 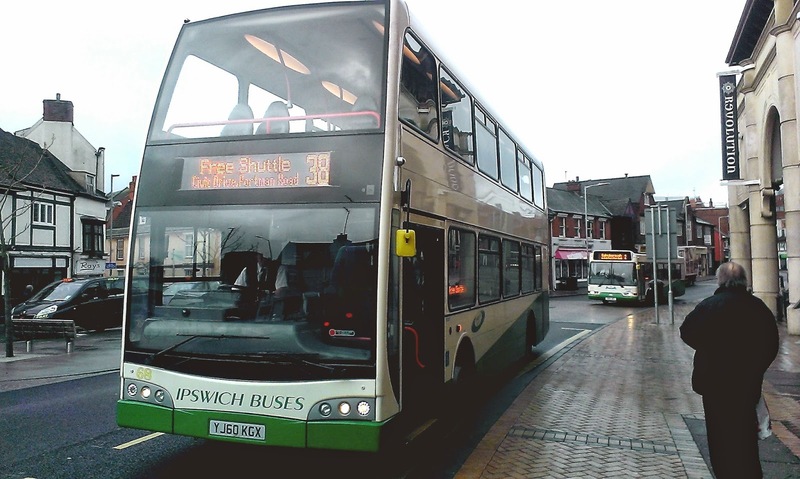 PS Many thanks to Malcolm Robson and the guys at Ipswich Buses for taking the header pic for me in the pouring rain a couple of weeks ago. Keep your eyes peeled as that pic may well change in the coming days! In Part One, which you can see by clicking here. I introduced the new Class 387 Electrostars being phased into service on the Thameslink route between Bedford and Brighton. These are going to replace some of the Class 319's in the interim period before the new Class 700 Siemens units are ready to be introduced during 2016, when the 387's and the on loan 377's will pass to Southern. However there is much more going on at Thameslink. They have borrowed some 377/2's from Southern which uaed to operate on the Croydon - Milton Keynes route. These have become available since the introduction of the 377/7 5 car units as revealed on this blog in Spetember. I managed to spot a couple at Blackfriars. In Southern colours but the Thamelink logo, 377210 at Blackfriars. I had plenty of time to take the pics at Blackfriars because a Brighton train had been cancelled. However that also gave me a chance to meet the chap who made everyone smile with his announcement. People like him take tension out of situations and should be cherished and rewarded. He was an artist on the PA, funny without going to far and clearly enjoyed his work. We need more like him! Blackfriars station has recent;y been completely rebuilt, and is nothing like the station I remember working trains out of 10 years ago. The platforms now stretch right across the Thames, and the bay platforms are the opposite side to the previous layout. Of course with the new design the views from the platforms are truly something else, and there can't be much better views from any other station in the country. Now I mentioned that the Class 319's are gradually being withdrawn and heading to pastures new. Some are destined for Lancashire and others cascaded around the country. So it is quite surprising to see some being painted in the livery being adopted by the Class 365's on the Western side of the old FCC network out of Kings Cross. If anyone can shed any light on this I'll be grateful. From the end of this week Thameslink services will no longer pass through London Bridge for 3 years while the station is completely altered and new tracks laid. Southeastern services are also affected so it was good to spend a few minutes at London Bridge which holds a lot of memories for me. So as a bonus here are a couple of Southeastern trains at London Bridge. Class 465 Networker 465164 leaves London Bridge heading for Dartford. 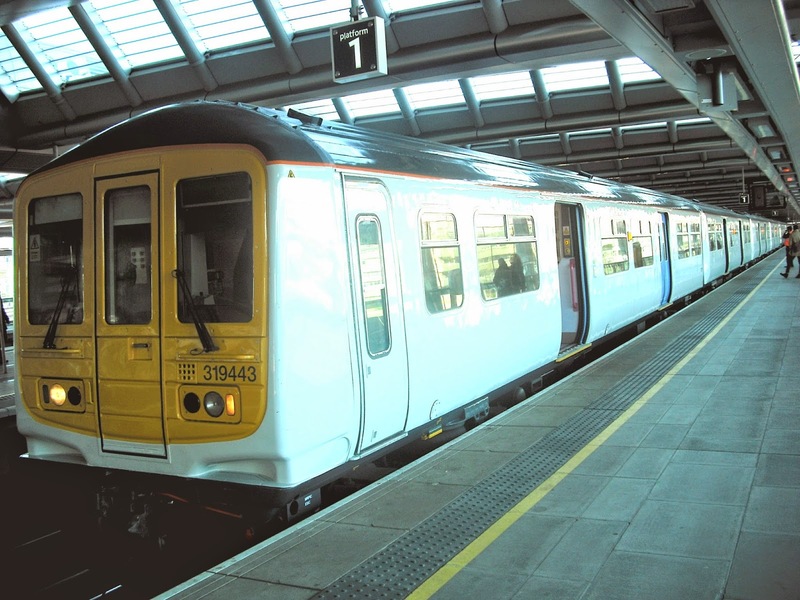 There are many types of Electrostar floating around, from C2C's 357's which look like 170's to the more familiar 375/7/9/87 versions on Southeastern, Southern,Thameslink and Greater Anglia. However the oddballs are the 376's belonging to Southeastern. Closed 5 car units they operate solely on the London suburban routes from Charing Cross/Cannon St to Dartford, Hayes and Orpington. 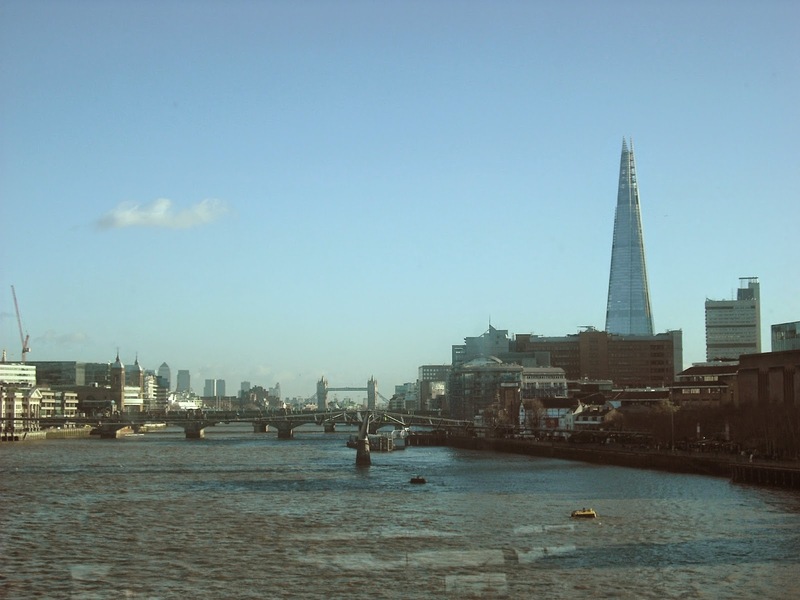 I managed to photograph one on this gloriously sunny day at London Bridge in what is up there with the best pictures I have ever taken. I hope you've enjoyed this look at Thameslink and if anyone has any requests for the rail side of the blog let me know and I'll do the best I can to get it done.